Published by Prime Books (Canton, Ohio); printed by Lightning Source, 2003. A preamble: or how Weirdmonger saved me from planning murder. You know that old curse about living in interesting times. Yesterday was interesting; I attended a disciplinary hearing at Cornwall College. The disciplinary hearing was their response to my most illness, but never mind that. I kept my temper for about half an hour listening to lies and more damned lies. I passed the time wondering what stone they’d looked under to find this pair of idiots conducting the ‘hearing’. Finally I stood up and had the brief satisfaction of seeing them both jump back in their chairs in alarm. I told them that I thought I’d been extremely patient with them so far but now I was going. When I got home I paced up and down trembling for a while. Then there was a rattle and a thump from the letterbox. A parcel from D F Lewis, the Weirdmonger himself, and the book was... Weirdmonger. The book that I think he's described as the most definitive or representative of his writing. It’s a hefty volume. And at that time and in that mood, I didn’t think I’d be up to glancing over more than a few pages. Surprisingly enough, I read a number of its short stories straight away, and as I read, it was a bit like relaxing in a warm bath and the frustrations of the day seemed to melt away. And of course, you know Des Lewis's writing, sometimes exasperating, often brilliant, always weird. D F Lewis has said (fascinatingly)of this book: "The book is ragbag of some of my mildly 'filthier' pieces as well as pieces I now actively detest (as well as some that remain good ones in my eyes!). It is almost as if it compiled itself. It has become a sort of Frankenstein monster. I never saw myself as Weirdmonger. This was surely a word for a fiction character. But I find myself being subsumed by it. It is a Horror film being played out on the internet, with a motley (often disinterested, sometimes engaged) audience *very sparsely* scattered in the cinema stalls. Always in Dim Shadow: paints a haunting miniature of childhood loneliness, sexual abuse and parental incomprehension in the (astonishing) space of a page. Apple Turnover: – which I mustn’t attempt to synopsise, it would spoil things – might be a simmering romantic reworking of a Biblical tale in the style of Cider With Rosie. In this one, consciously or not, Des has touched on one of the more curious aspects of vampirism as sexual symbolism in dream imagery, touched on by Tom Chetwynd in his brilliant Dictionary for Dreamers, namely the idea of double-penetration: that as the vampire’s teeth enter the victim’s skin, the victim’s flesh is entering the body of the attacker. Back Doubles is a slightly longer story, about 8 pages: Kit is obsessed with St Paul’s Cathedral. Representations of its dome are shown in wallpaper decorating his bedroom walls. He collects colour supplements, second hand books, prints and old maps dealing with the history of the cathedral. But until today, he has never actually seen the place with his own eyes. Today will be the day that he finally realises his dream. Clutching some guidebooks and a packed lunch, he boards a bus and sets off on a journey enlivened at first by the cute bum of the bus driver's groupie. But as he reaches the second stage of his journey, a ride on the underground, things start to fall apart; his travelling companions become more decrepit and sinister, the underground platforms are lit by candles and thronged with shadowy figures, and we wonder if there is truth in the old myths of passengers long lost to daylight in collapsing tunnels and trapped carriages. Escaping the train, he becomes lost above ground, and entering an alley finds himself in a quite different place – a woodland lost in the heart of the city, and in the wood, another cathedral. But there is something very wrong about this cathedral. Something dreadfully wrong about the crucifix in its shadowed interior. This story begins in whimsical fashion, becomes a little grotesque, then as it brings to mind memories of films like Death Line and Quatermass and the Pit, actually gave me some very real chills. I’ve dealt with this story in some detail here because the ideas and imagery are quite intensely packed and as I’m writing, I can see there’s more to find in it yet. 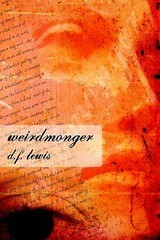 What I’ve read so far suggests that Weirdmonger is a pick-and-mix goodie bag of the strange, the disturbing and the really quite nasty best of D F Lewis. Dear Mum: The astronaut, lost in space, spends his last days writing a message to his mother – now probably dead herself – but science is wonderful, so she might still be able to read it. There are enemies out there in the black depths, and he thinks he has seen the silvery flickering of a tail. It’s time to jettison Holmbee’s body, but what will those space dwellers do with it? The house is like an English House of Usher (assuming of course that this is England in the story); it’s located at the edge of the eastern marshes, and its foundations are sinking into the mud. The child rejoicing in the name of Digory Smalls seems to be a relative of Henry Kuttner’s mutant hillbilly family, an excitable and cheerful infant with paddles instead of limbs. When the narrator decides to explore the upper reaches of the attic, he decides to take Digory along for company. And who knows what strange family members might be found up there. So begins an exploration which, at six pages, is a Lewisian epic and tour de force.